s about The Running Man heirs. The setting is at a garden and in the middle is a long table lavished with foods and drinks. I laughed out loud at the opening as Lee Kwang Soo walked in with animated fallen leaves surrounding him as T-Max song 'Almost paradise' played at the background. After that Haha and Kim Jong Kook joined him. I liked how Kwang Soo fooled around with Jong Kook hyung by playing with his sunglasses, only to be hit at the head by Spartakook. Ji Suk Jin and Song Ji Hyo arrived later to form a team. Oh, that high heels shoes of Ji Hyo makes it difficult for her to walk in, thus she ordered Kwang Soo to help her. The members looked in awe as she dressed up in a pretty dress. Yoo Jae Suk and his team (Gary, Guests - Park Shin Hye, Kim Woo Bin and Choi Jin Hyuk) came along and Jong Kook immediately greeted Park Shin Hye whom starred in his Music video - Letter. Talking about love line and the members immediately teased him about Yoon Eun Hye who resembles Park Shin Hye. Kookie turned shy at these comments and pretended not to hear. It is now a battle of Oil team (Jong Kook team) Vs. RM Fashion team (Jae Suk team). The first mission is to pull out the Toilet plungers struck on the wall. Kwang Soo had a hard time pulling them out. On the other hand, Choi Jin Hyul had it easier although he had some difficulties at first. Now at the upper hand, Jae Suk team (Blue group) tried to make things difficult for the yellow team by placing a plunger at the top of the wall, only that the result is unfruitful. Because tall Kwang Soo still can reach out to the Plunger. Ji Suk Jin is the funniest when he tried to pull out the Toilet plump as he had little strength to do so. In the end with the help of Haha, they managed to pull them out. Nonetheless, they lost to Kim Woo Bin and Choi Jin Hyuk who managed to pull all the toilet plungers out within 7 Seconds. The next mission is water game located near the cruises. They will appoint a key player from each group to compete against each other. The winners will receive two cards and they can use it to splash a cup of water on the opponent that loses the game. That was interesting! First, we have Kwang Soo competing with Woo Bin on thumb wrestling. Kwang Soo showed off his flexible thumb and indeed won the first round. He started to act and prepared to splash water on Woo Bin but he had to NGs two times before he can splash the water on his face. The next round we have the girls competing each other in a left and right coordination game. Gary had to say out the command while the girls place the spoons (Gold, Sliver) on both eyes and shuffle between his commands. Ji Hyo lost due to some disturbance by Gary. Haha and Jae Suk were competing with each other to see who can change their clothes the fastest in the changing room. Yoo Jae Suk almost wins, however Haha managed to zipped up his trouser first and secured the win. Punishment for Yoo Jae Suk is to be splash on the face. Kim Jong kook and woo Bin were competing against each other. With scissors, paper, stone. The person who wins will use the toy hammer to hit the opponent head and he must use the metal bucket to cover his head. We saw the two competitors competing intensely until Spartakook lost the last game. Now everyone started to queue up in an attempt to splash the water at Spartakook. LOL! That was so funny and their reactions were too hilarious. Kwang Soo even tried to used up the tickets which he won in exchange for a chance to 'seek revenge' on Spartakook. Instead of 'punishing' Jong Kook hyung, HaHa splash his cup of water on Kwang Soo. Only Choi Jin Hyul succeeded in splashing water on Spartakook face. That was really fast and taken Spartakook by surprise. The rest of the cast agree that his timing is good. Yoo Jae Suk came face with Spartakook and instead of splashing at him, he gets splash by the water instead. In a fit of anger, Jae Suk took a tub of water from Gary in yet again attempt to 'punish' Jong kook. However, Jong Kook hit the tub back and the water splash on KANG GARY! That was a classic scene. The next mission is at the water float and they have to compete in a head fight. Haha and Jae Suk came head to head at the water float. Initially it looks like Haha will win, however, Jae Suk managed to overcome the pain and outwit Haha. Subsequently, Kwang Soo lost to Woo Bin and left with Jong Kook on the water float. Jong kook is like a bull when he competes with the male guests but turned into a big softie when he faced with Park Shin Hye. Being a gentleman, he allows Park Shin Hye to win the game. The last game arrived at the SBS building and the teams have to find the 'shareholders' and get their signatures. Jong Kook, Ji Suk Jin and Haha arrived at a live broadcast and the audience was shocked. Park Shin Hye soon arrived and dance for all to see, not to be out win, Jong Kook showed his muscular 6-pack abs to the audience and won the deal. It was funny to see the teams competing and went into different room to close the deal. The last group they need to find is Girl's Day, and sharp eyes Park Shin Hye found them first. Both groups begin to compete and Jong Kook team even dance to their song. Nonetheless, Jae Suk team closes the deal and Park Shin Hye secretly went out and sat on one of the five seats. Both teams were fighting over the envelopes and in the end, the RM Fashion team won. Now the RM Fashion team has to cash in the account at the ATM machine and there are even 0 cents in the bank book. After all the accounts balance were revealed, Choi Jin Hyul won the game with the highest amount of balance. 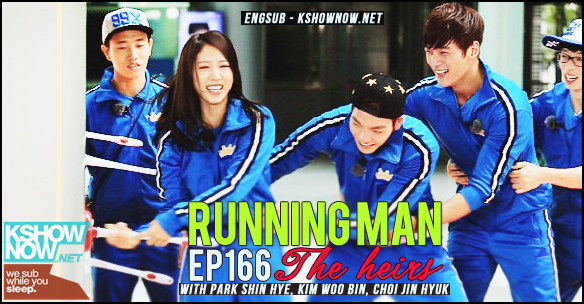 He is officially the Running Man group heir as he was presented with his reward. I could guess that the guest’s team will eventually wins the game. This episode was supposedly made to promote the new drama of SBS 'Heir' starring the guests. It was a predictable episode as most of Running Man episodes; however, I like the water games which are always funny and interesting. No surprise that Jong Kook will give in to a female guest, to top it up, Park Shin Hye resemblance Yoon Eun Hye. It had been some time since they teased Jong Kook of the Love line, hopefully Yoon Eun Hye will drop by Running Man one day. The splashing water game is funny and I expected that Spartakook will splash the cup of water back at Yoo Jae Suk. However, I did not expect the whole tub of water to land on Gary who stood behind Yoo Jae Suk. That was a real surprise and is one of the most classic scenes in the recent Running Man episodes. Park Shin Hye can dance really well; Choi Jin Hyul and Kim Woo Bin were good lookers and were funny in their own ways. 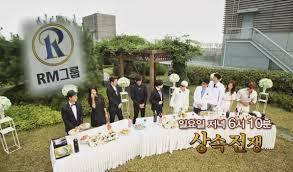 It will be good if Running Man brings back the Name-tag tearing games as I missed that segment of the game. Despite all the criticism, I still enjoyed the show especially the recent episodes.